John and I have talked about getting a dog for a long time. We were never home enough, had no fence, no time, etcetera. And let’s face it, cats are EASY. John wanted a German Shepherd. I did not. I wanted a Golden Retriever or a shelter dog, something more giant-lap-dog-ish. John did not. So when I visited Highgate Farm in late October and met Kelly, an English Shepherd, I got very excited! The perfect compromise; an English Shepherd is part family dog, part guard dog, a hiker, has herding instincts, high energy and a great disposition. I came home and told John about Kelly, he did some research and a consensus was reached. English Shepherd was the breed for us! We began our search for a breeder and found 4 within a 4 hour range of Western North Carolina. I filled out several questionnaires; about us, our pets, our thoughts on training and discipline, why we wanted a dog, how we would keep a herding dog happy. Lots of questions, lots of essays. We talked to breeders on the phone, like nervous potential parents we worried about saying the wrong thing, blowing our chances. It was an interesting experience. Fortunately we passed the test with the breeders we elected to talk to. I was actually glad they care where their puppies end up. We began to correspond with Carla from Old’s English Shepherds, near Roanoke, Virginia. She had a litter born October 2nd, almost ready to go to their forever-homes. 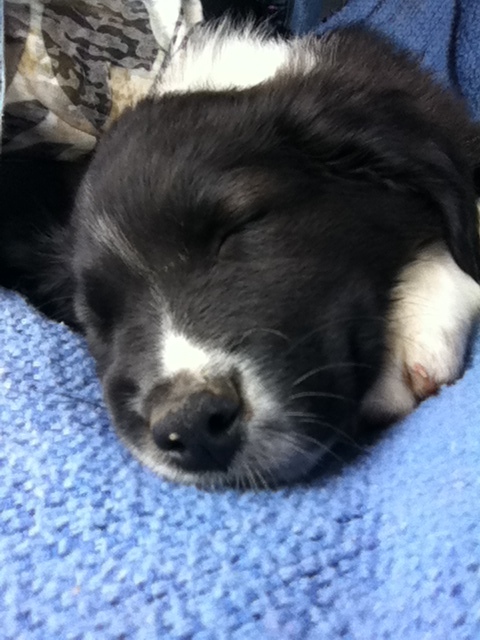 Carla sent us the cutest summary from the little squirt herding trials. 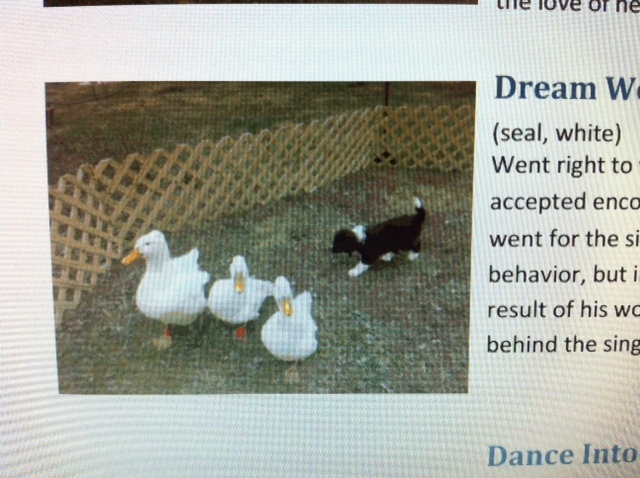 This picture shows our eventual puppy at 6 weeks, herding ducks. The text with the picture read “Dream Weaver – hit heads and heels (seal, white). Went right to work as soon as released in pen. Worked close, accepted encouragement from me. Consistently singled out a duck or went for the single. Usually indicates predatory rather than herding behavior, but in this case the single always rejoined the flock as a result of his work. At one point, I was working 3 and he tucked in behind the single to drive it to my 3. He did grip once (tail).” I saw the tip of that tail, white like it had been dipped in paint like his paws, and thought he was so adorable! We brought him home that day at 8 weeks old and our lives have not been the same since! We had a 250 mile drive. We had a carrier with us, but I didn’t have the heart to take him from Mama and put him in the crate. So I climbed into the backseat of John’s truck and held him in my lap for 5 hours. He whined a time or two, but was remarkably calm overall. He got stressed when we stopped for lunch, screamed like he was being murdered when we left him in the crate in the truck for 15 minutes. We were all glad to get out of the car! My sister-in-law Cindy and my niece Samantha came to visit as soon as we got home. They thought he was pretty adorable, too! We renamed the puppy Takoda. It’s an American Indian name meaning “friend to everyone.” He is thus far! We take him to a new place to meet new people almost every day. He is a baby, nervous, but loves the attention. In the dog friendly town of Weaverville, he is allowed in the shops. Most have puppy treats and water bowls for dogs. He has debuted in two towns, Weaverville and Marshall; he was equally popular in both. What’s not to love? He’s so cute! He went to a party at my sister’s at Thanksgiving, we had 17 humans, another dog, a cat, and several chickens. He did pretty well. He knows a few commands, like SIT, LIE DOWN, and IN YOUR HOUSE. We are working on a few more. 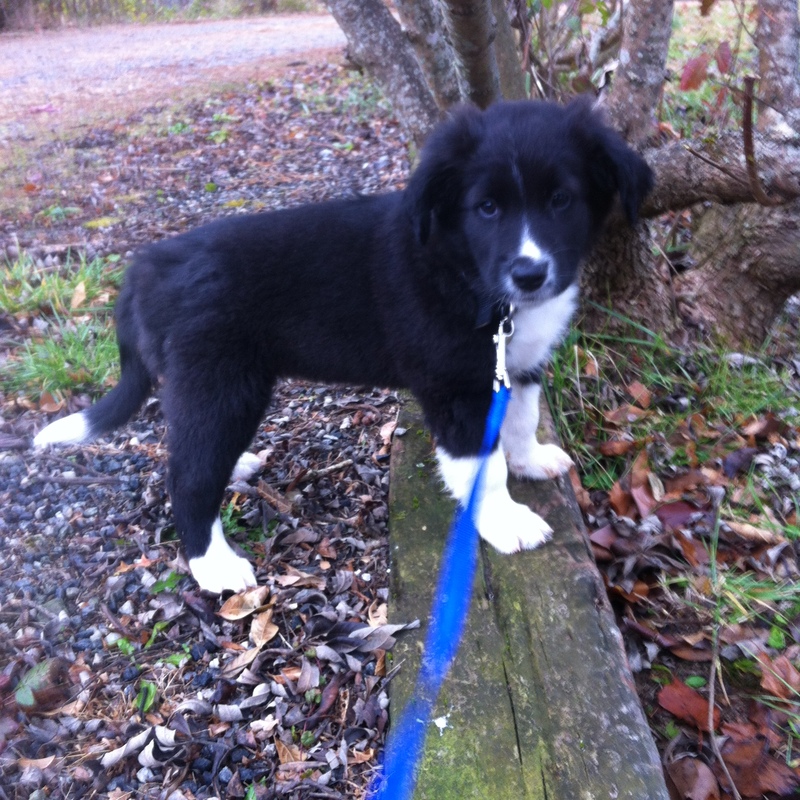 He is pretty well leash trained now, and we are letting him off the leash a little as of today. Still not sure what he’d do to a cat or a chicken, so we are cautious yet! He has a large toy collection, 22 acres to walk on, 2 cats and 3 chickens to pester. Our young cat, Rory Gallagher, has taken to sleeping in the bathroom sink. Our old cat Amos is thoroughly pissed and stays under the bed for days on end. Meanwhile, Takoda is oblivious to all that is not food-related. He is a funny little character. It’s late, the monster is asleep, and I need some shut eye. I’ll keep you posted on the new baby and his antics. Mary, your story cracks me up. Well good, David! Nice to know you’re still out there!